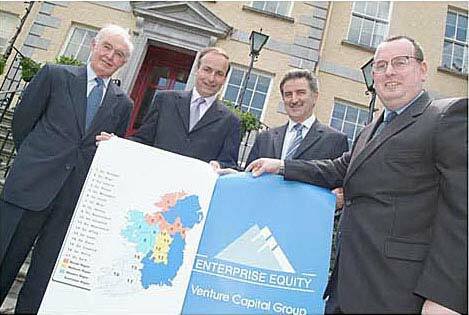 Enterprise Ireland and Enterprise Equity Venture Group to invest €3m each. A decision by the Department of Enterprise, Trade and Employment to provide an additional €6m in additional capital (VC) funding to the Enterprise Equity VC Group boosts the fund to €22m for high – potential companies in the Border, Midland, West (BMW) and South-West regions. Minister for Enterprise, Trade and Employment, Micheál Martin welcomed the contribution from Enterprise Equity and EI. He said: “Each organisation is contributing an additional €3m to the existing €16m fund, increasing the total value of the fund to €22m. “I am particularly pleased to see Enterprise Equity extending its remit from the BMW regions to include the south-west region. This expansion offers new and existing companies in the south-west an important new source of potential capital and I would encourage firms to explore this investment option,” he added. Denis Rooney, chairman of the Enterprise Equity VC Group and of the International Fund for Ireland (IFI) believes there is significant untapped potential investment opportunities in the BMW and south-west regions. “In the past, Enterprise Equity investments have traditionally levered €1 or more of the funding from other sources for every €1 invested by Enterprise Equity. “As a result we believe our joint venture with EI will result in at least €44m of investment for these regions,” Rooney said. It is understood since its foundation, Enterprise Equity VC Group has invested in 73 companies in more than 130 transactions. “We look forward to bringing this base of experience, capital and contacts to companies in the south-west area, particularly in the ICT, medical device, food and biotech areas,” said Conor O’Connor, chief executive of Enterprise Equity. The extension of the fund to the south west comes at a time when investment appetite among VC companies is increasing. “High-growth companies require equity finance and EI’s policy of working in partnership with VC companies is a core part of our strategy,” commented Seán Higgins, manager of investment services at EI.